Since around a year or two I've been using i3 tiling window manager together with the xfce4 services as my desktop environment and I'm quite content with the result. 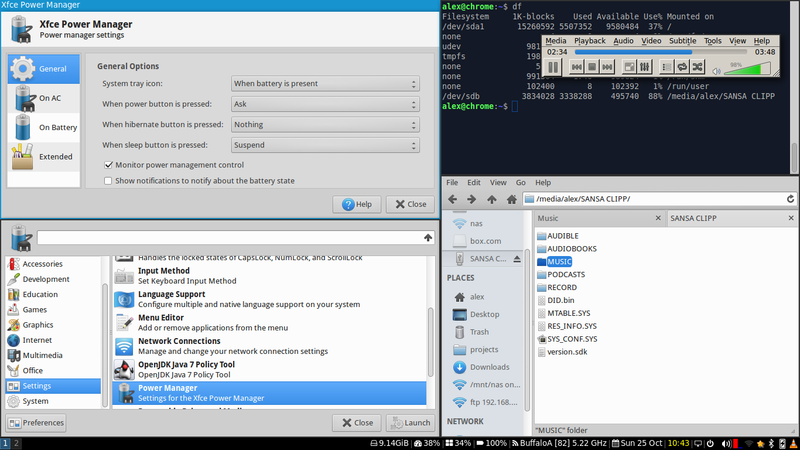 The i3-wm can be installed on top of the xfce4 DE without any package conflicts. Such a combination allows to have both DE at the same time and share common settings and applications between them. I can't remember exactly why I have chosen the i3-wm as my window manager but maybe it's because I have read that i3-wm has vim style movement keyboard shortcuts. As far as I'm a vim user I decided to 'take it for a spin'. Beside the original i3-wm site, lots of useful information about i3-wm usage and configuration is availabe at archlinux wiki page. I have used that wiki as a starting point. All configs and scripts described in this article are available at my git repository . Use it at your own risk. I'll describe at the end of this article how do I handle my dotfiles too. Add the repository how it is described on this page but instead of installing i3 package install i3-wm and sucklesstools only. The i3-wm package comes with a user guide html page that is installed at /usr/share/doc/i3-wm/userguide.html which is a good source of information about the i3-wm configuration. My complete .i3/config file is available here for the reference. First I need to say - do not follow an advice you may find on the Internet to use a normal xfce session with the i3wm added to the autostart - that's just utter BS. 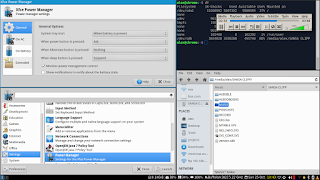 Always start a separate i3 session and start only xfce services you need. In this case you'll get a really lightweight desktop environment which is blazing fast and uses less RAM. In this example my active screen is called 'eDP1' so I'm not affected. On other notebooks I'm using, I have 'LVDS1' and I had to patch the daemon. The patch is pretty much easy - find 'LVDS' string in the xfsettingsd binary and change it to somethings else with any hex editor. After I changed it to 'LVDD' everything started to work smooth. But then I realized that the xfce4-volumed does absolutely the same thing and now I simply start it and the bindings above are removed. And the next daemon I start is the xfce4-power-manager. It manages power states of the computer and it also handles screen brightness key bindings. To display my status I'm using conky and a small shell script that also handles mouse clicks in the status area. I installed the conky-cli package and continued with the description given on this page . The first thing I stumbled upon was constantly blinking status line. After lots of time spent on that issue I realized that the description on the page is wrong. The json output that conky sends should always be in one line otherwise the status line blinks. If you check my .i3/conkyrc config file you'll notice that all strings after the 'TEXT' keyword are ended with the backslash to make it appear as a one line. Second thing was to extend the suggested wrapper script .i3/conky-i3bar so that it would also handle mouse clicks. Well it wasn't that difficult in the end. I just added a loop that reads and handles script's standard input stream. So the .i3/conkyrc, .i3/conky-i3bar and .i3/config files are coupled together. Instead of rainbow alike status line implemented by others my status line is white unless something important needs to be shown (the exception is the current time shown always in yellow). For example if the CPU temperature increases then the cpu status is shown in yellow, then in orange and then in red. Information which is not actual is not shown at all. For example the LAN status is only shown when a LAN interface is up. Or only if there are new mail messages the new mail status icon is shown. Shows active layout and it also turns red if caps lock is pressed. I must say that this is not a very optimal solution. First it would probably not work if there are more than two layout present at the same time. Second it requires gawk to be installed (ubuntu has mawk by default which is fast but lacks functionality). Third xset causes lots of wakeups for some reason that drains the battery a bit faster. Unfortunately conky-cli package I'm using is compiled without WLAN support. I had to write a small script .bin/apstatus.sh that outputs the status. If my notebook is connected to an AP then it would show the AP name, signal strength in percent and the channel frequency. The same drawback here as above - new processes are started constantly that drains the battery. If LAN is up then LAN interface name and its speed is shown. An interface name could be 'eth0', 'eth1', 'eth2' or 'p3p1'. If this is not the case then the .i3/conkyrc config file should be adjusted accordingly. If a VPN is activated ('tap0' is up) then a blue lock icon is shown. To adjust display settings (multimonitor) I'm using default xfce4-display-settings program which is called when the icon is clicked. The rest of the .i3/conkyrc is self explanatory. I'm starting the network-manager too that shows a small icon in the system tray but it is very small and also there's no keyboard binding to open its connection dialog. I've written a simple bash script .bin/wifi_connect.sh that shows a dialog to connect/disconnect to/from an AP. The script is bind to the 'mod-shift-w' combination and it is also possible to navigate opened dialog using keyboard only. I have also installed feh to display a desktop background. Principally it's not needed but some display drivers are displaying garbage because they aren't cleaning the frame buffer after the start. The 'sucklesstools' package comes with a program called slock to lock the screen. If you do not have any other screen locking tool installed then the slock will be called when the lid is closed and then opened (check the logic in the /usr/bin/xflock4 script). It has really confused me the first time because it shows just a black screen after the lid is opened. Just start typing your password and the screen should turn blue to provide a notification that the password is been entered. To synchronize my setting over all my computers I'm using a git repository and a dotfiles management tool . Thank you, this is very useful ! I had hard time to figure out why my volume buttons work in XFCE and don't in qtile.